3D printing at home finally starts its career this year. What can inspire a kid’s Creativity more, than to design, print and assemble his own toys. A 100 years ago children used to craft their toys from peels, wooden sticks and pebbles. What about a nice slingshot or a sailing boat? In this century Modern Technology encourages the boys and the girls to 3D print self-designed toys at home. 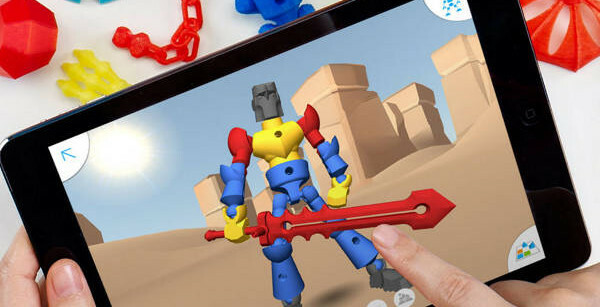 Mattel, the popular Toy Factory partnered with Autodesk, the leading 3D software developer company. 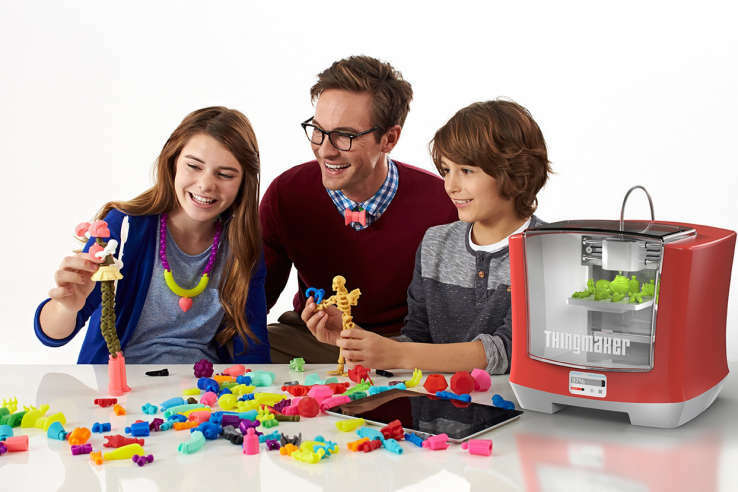 They launch a family-friendly 3D printer in the U.S. consumer market by the fall of 2016. From February 2016 you can pre-order the machine for 299 USD at amazon. Mattel already had experience in molding. Mattel used to have a toy series in the past. This was the ThingMaker. Wikipedia refers to this toy series as Creepy Crawlers. Creepy Crawlers was out in the market in 1964. In 1966 a flowery toy, made for girls was published. This toy received the Fun Flowers brand name. Every item in this series functioned in the same way. Kids had to pour a sticky material into a metal pot, and this pot went into an electric machine, where high temperature was applied. Then the shape got solid and hard by the temperature. After removing the metal pot the toy was ready for play. This set was suitable to make toys and jewellery too. This molding toy, the ThingMaker was re-edited in 1992. The new brand became ToyMax. And now in 2016-ban it debuts again, accompanied with a 3D printer and modern digital applications. 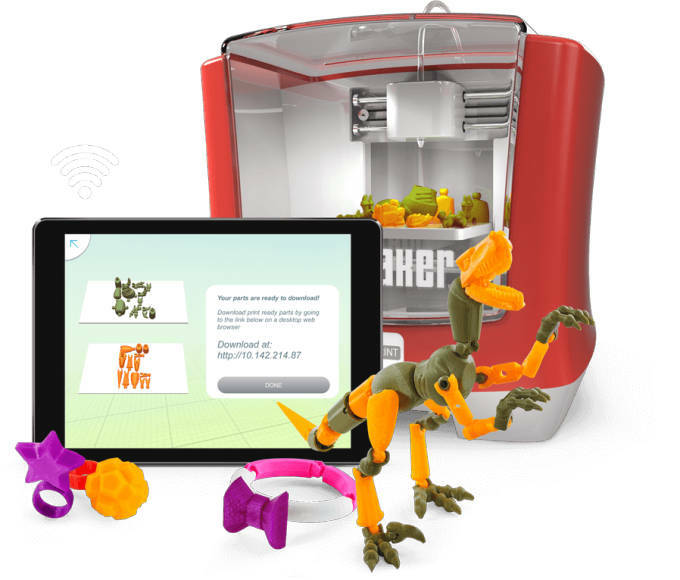 With this 3D printer you also can print keychains and USB flash drives apart from the great toys. The printer door automatically locks when printing begins to prevent reaching inside while the heated printer head is in motion. When printing is ready, the heated print head retracts into a recess. In this way little hands can’t reach the hot PLA. The PLA is an eco-friendly printing material. How does playful 3D printing work at home? The Toy Factory Mattel has a complex approach to the mini toy factory at home. 3D printing at home starts with a reasonably priced 3D printer and some colourful filaments. Kids can choose from 2 dozens of biodegradable PLAs; some is luminescent, bright in the darkness, some is shiny and glam. Of course other PLA printing materials, you can purchase from other sources not from Mattel, are also compatible with the printer. The maximum printing size of this family-friendly 3D printer is 10 x 10 cm. Put parts with the same colour on the same plate. This is like a LEGO game or a Kinder Surprise! After printing kids are spending hours with assembling, time depends on the number of small parts and elements. For instance to assemble a gigantic dinosaur or a knight, abundantly supplied with accessories and weapons, can be a whole day fun. All ThingMaker Design printed pieces use a ball and socket joint system. Frequently Asked Questions regarding printing these joints are already out there at ThingMaker’s website. This is useful since the ThingMaker Design app is ready to download fromGoogle Play and iTunes. This means the ThingMaker Design creations are already available for printing and assembling if you have a 3D printer at home or in your office. Kids can choose the toy they would like to print from an enormous digital catalog. But this is not just a toy catalog. Mattel has thought it further. 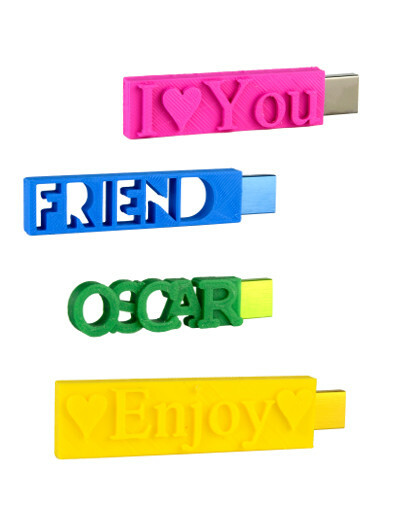 Every single printable figurine or jewelry can be customized part by part. The printable parts and elements can be separately drag and dropped into the creation; different colors can be added. A superhero for example can get different heads and helmets. You can pull a sword or an ax into his hand. All depends on your taste. You can even customize the surface! This all develops the Creativity of your child. I’ve downloaded the app to Android and it is easy-to-use indeed. It is more simple to use it on tablets than phones, but it was quite user-friendly even on the screen of my Samsung S4 mini. The video below has brought me a total understanding on how the app works. I suggest you to watch it before opening the app. The second half of this 4 minute-video shows you the operation of the ThingMaker Design app. So the STL file, what you download from the ThingMaker Design app is compatible with other 3D printers as well. Moreover the app is connected with MakerBot and Replicator2. So if you have a MakerBot you can indicate 3D printing straight from the app, clicking on the print button. The 3D printer is connected to the app by wifi. You have to fill the right filament in place, click on the print button, and your 3D printer starts printing the parts all in the same color. The app puts the parts with the same color onto the same plate. The app tells you how long it takes to print the whole figure, and it also tells you how many gram PLA is needed. You can download the files to your Google Drive, or to Dropbox too. If you do not have such accounts in the cloud, the app gives you an IP address and typing this address into your web browser you get to the download page of your chosen toy or jewelry. This is how the download page looks like. Same colors are on the same Plate. You download a zip format. After unzipping you get your STL file and can start 3D printing at home or in your office. This might seem too technical, it’s true. But our teenage kids can handle the whole thing. ThingMaker and the ThingMaker Design app is recommended to 13 -year-old teenagers. These kids can also design with a 3D designer program. Apart from Autodesk Google also has 3D designer program. This is a free software, called SketchUp.